Treasure Island Media sponsors Bear, Bikers and Mayhem! Next week is an awesome event in Gettysburg, being hosted by none other than one of our favorite TIM studs, Aarin Asker! 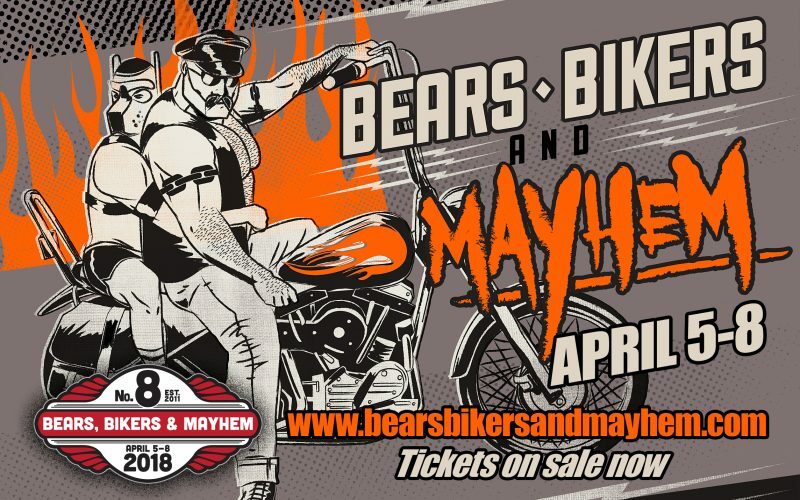 Bears, Bikers and Mayhem is a weekend of camaraderie and debauchery that unites the Bears, Leather Men, Motorcycle enthusiasts, and Fetish/Kink communities with food, fun, and more from April 5th-8th in Pennsylvania’s capital city. They raise money for HIV/AIDS and other charities, hold a Mr Mayhem Leader / Leather Bear competition every year, and have been growing their attendance since their inception in 2011. Aarin reached out to us about his hosting an event, and we had to be part of it. We’ve sent him an awesome assortment of TIM DVD’s and swag to spread the love and show our support, and invite all of you to check them out at bearsbikersandmayhem.com, and grab some tickets if you’re in the area – we can’t imagine a better way to spend the weekend. If you’ve got an awesome event or organization that would like to work with TIM, visit treasureislandmedia.com/events and fill out the application – we’d love to work with you and will get back to you as soon as we can.